LET’S KICK YOUR INBOUND MARKETING INTO GEAR! We are an elite group of former corporate search engine and social marketing professionals based in La Mirada, California, passionate about our industry and committed to your success in inbound marketing. Our team focuses on improving the volume of leads and sales that come from organic and paid search results. That being said, we know when money is being spent that our clients are looking very closely at keyword rankings that play in role in getting those new leads and sales. Below is a graph showing how one client was able to get on the first page of Google for 79 competitive search terms within 8 months. More importantly, the chart shows the time it can take to achieve higher rankings. SEO is a marathon, not a sprint. With strong link scheme guidelines in place, the only way to satisfy search engine authority and popularity signals is through a strong content marketing strategy to establish the website as an authority on industry topics in a way that compels visitors to share, link to, and search again for the same piece of helpful content. 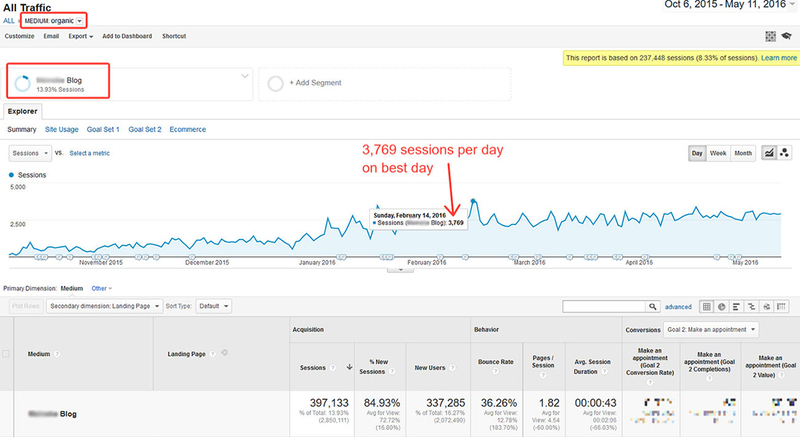 Below is an example where our keyword research and structured calendar of helpful content help generate over 500k visits to a brand’s blog, along with hundreds of inbound links and return visitors. Titles included “how to”, “where to”, “tips” and other questions where the brand was able to come up with the most useful page. But Did It Attract Links? With Google RankBrain (new artificial intelligence, learning engine), the value of hyperlinks may be less important than the actual “usefulness” of a webpage. However, mentions and references to topic-relevant content not only supports off-page SEO efforts, but can drive incremental referral traffic and brand awareness. In the case of our example above, blog content was able to attract an additional 400 inbound links, many of which actual drove traffic. Our strategy typically includes research and audits to support a long-term SEO and/or recovery campaign to give the impression of natural growth in visibility to important search engines. To the right is a typical timeline of events that occur during a normal SEO project life cycle, with month 1 heavy on analysis and strategy, month 2 on technical task execution, and ongoing optimization based on learnings, tests, and content marketing planning. 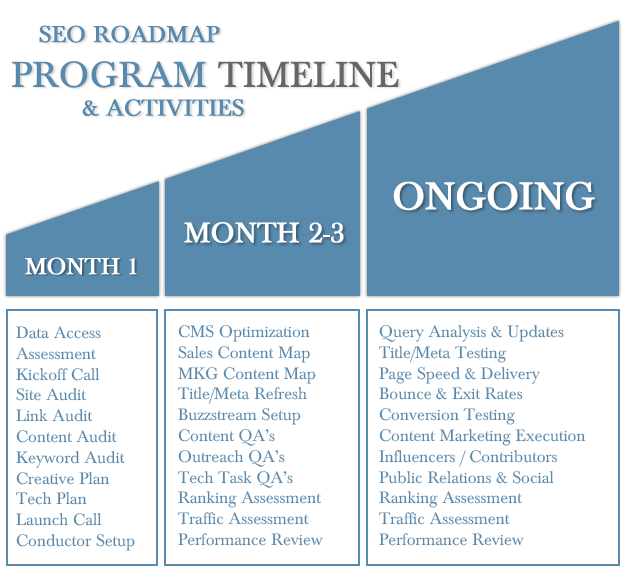 Once completed, we’ll have a recorded webinar-based conference call to review our findings and recommendations; all of which typically get added to our SEO Roadmap (or your project management system). Tasks get assigned to your webmaster, content writer and visibility specialist, filterable by priority and effort level so there’s never a question of “where do I start” when it comes to task management. According to Google, search engine rankings begin before their web crawler (Googlebot) even reaches a page on a website. Signals that help understand the page are found within the content mentioning or hyperlinked to your website, which may include the usefulness and history of the linking page, words used on the page and within the links themselves. Ranking signals on your webpage may include freshness, words used on the page, spelling, synonyms, URL and title, personalization, and recommendations made by people you are connected to. At the end of the day, we only have clues, hints and guidelines, which passionate SEO’s like us turn into “best practices”. In 2016, the theme of all Google conversations with webmasters has been centered around the phrase “usefulness”. Since there are varied types of users searching Google from different devices, operating systems, browsers, accessibility equipment, and connectivity limitations, webmasters must think in ratios. What percentage of users find a page useful? The answer should be as close to 100% as possible to receive the maximum amount of possible impressions within search results. Search quality guidelines are updated regularly and should be read and understood by webmasters and marketing teams to prevent penalties and to stay up-to-date with acceptable practices. Google is constantly providing helpful background and infographics to help marketers provide great results for their searchers. Our job as search marketing consultancy is to stay up-to-date with changes, trends, and best practices to help our clients maximize and grow organic traffic through technical, contextual and visibility strategies that culminate into long term traffic and conversion performance. It is paramount to a successful search engine optimization or advertising strategy to choose team members who are passionate about the industry, scientific in running experiments and studies with focal points that improve the usefulness of a page, video, image or other result typically found in search, and who maintain a great relationship with the search engines themselves. We maintain a continuous thread of communication with Google and are certified in AdWords and Analytics. Below is partial list of publications our consultancy has been featured in as an “expert” in the field of search engine optimization. Clients and agencies from around the globe have hired our consultancy to provide technical and creative strategies for natural, paid and location-based search engine optimization. In most cases, these clients have internal technology and marketing teams that come together to support improvements in keyword rank and search engine saturation. Our consultancy has contracts and agreements with the following service providers and is able to offer variable discounts, premiums and priority support escalations. Our mission is to bring back trust and transparency to an industry that has jaded many businesses. Our open communication-style of consulting will reassure your team that we’re truly right by your side day in and day out, with all working assets available to every team member, so there’s no “secret sauce” or uncertainty about how is working on what. Let us prove ourselves before you make a commitment by having a free search marketing assessment. Once we receive your client needs analysis, we’ll have a brief assessment of your current SEO status in your hands with 24 business hours. In other words, you have nothing to lose. Simply click the Review My SEO button below to get started.